A query on the new bothies forum http://scottishbothies.freeforums.org/ got me thinking about an area of the Cairngorms that doesn’t normally attract much attention. Preas nam Mearlach, or The Robbers’ Copse, is the area around the ford over the Luibeg Burn as you start to cross from the Luibeg into Glen Dee, just before the climb over the shoulder of Carn a Mhaim. My father used to tell me how he and his pals would camp up at the Robbers’ Copse in the years after World War 2; he never specified a site, but from the way he spoke I always imagined him pitching a tent in the woods south of the Luibeg Burn, for they used to come right over Feith na Sgorr, regarding it as a ‘short-cut’ to avoid the Derry road. But the area I’m concerned about is the course of the burn and the gravelly flats around the ford. For there has been more going on there than you’d think. 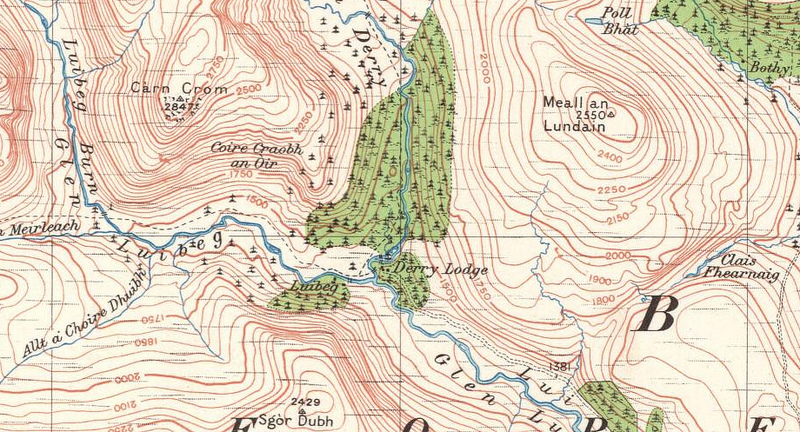 The query on scottishbothies arose when someone noticed that there was a bridge marked near the site of the present ford in the 1928 Ordnance Survey map, and someone else commented on the existence of what looked like the remains of masonry bridge piers around there. In fact the remains to be seen today are nothing to do with the bridge marked on the 1928 map and a lot more to do with the bridge which sits half a mile upstream. But let’s go back a bit to start with. Given that Glen Lui was inhabited for centuries, and that the Lairig Ghru was once a through-route for trade (Apparently great quantities of eggs were taken through here! ), there was almost certainly a bridge of one sort or another since ever people got fed up of wet feet, although how permanent it ever was is another question. Whatever bridge may have been there back in 1829 disappeared on August 4 of that year. On that day a tremendous rainstorm (which saw the River Dee rise by over 15 feet in places and saw great inundation of farmland and homes) created great floods which tore trenches down the hillsides and triggered a debris flow which ripped down the course of the Luibeg and left a fan of gravel and rocks 150 yards wide (about 130 metres) and a quarter of a mile long where the ground levelled out around the present ford. It not only tore away any bridge that might have been there but also completely obliterated the path. That’s why the ground around there is so gravelly and bare of peat: most of it was laid down in one day back in 1829. 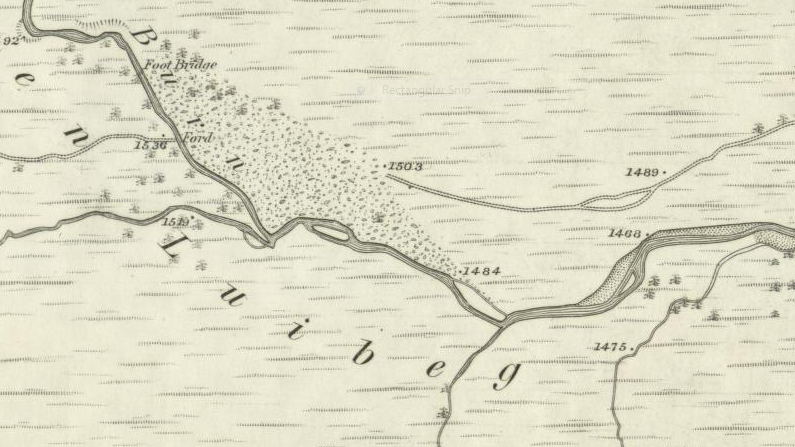 The 1869 OS 6″ map shows the extent of the flood debris covering the path as it approaches the Luibeg Burn. This was surveyed in 1866, over 35 years after the flood. At some point (maybe even more than once) a bridge was rebuilt where the path crossed the stream. There will certainly have been one in place during the area’s heyday as a shooting estate in the Victorian era and, as noted above, one existed in 1928. Twenty years later the bridge was getting to be in a poor state of repair, consisting of two tree-trunks side by side, with a walkway of planks (not all present), and the Cairngorm Club, presumably as fond of dry feet as the next club, took it up as a project. With contributions from other climbing clubs as well as CC members, a fund was raised in 1947 and the bridge was built in 1948. It used the relatively newly available material of aluminium to ease the problems of weight which would have been involved with a steel structure, although the feat of transporting the two hundred-kilo beams was still considerable, not to mention the 22 cwt of cement, several 60-kilo concrete slabs for the footbed and other sundry materials. The resultant bridge, which was built adjacent to the existing log bridge, was just over 23 feet long and raised to just over 2 metres above the average height of the Luibeg Burn, courtesy of two stone piers. It was named in honour of a former club president, James Parker and officially opened in November 1948. However it wasn’t to last for long. In 1956 came another tremendous rainstorm. Over the course of August 13-14 the water came down with such force that the bridge piers themselves were washed away and the bridge pushed downstream. It can hardly be seen as a reflection on the skills of the bridge builders, for the whole streambed doubled in width, to what can be seen today. 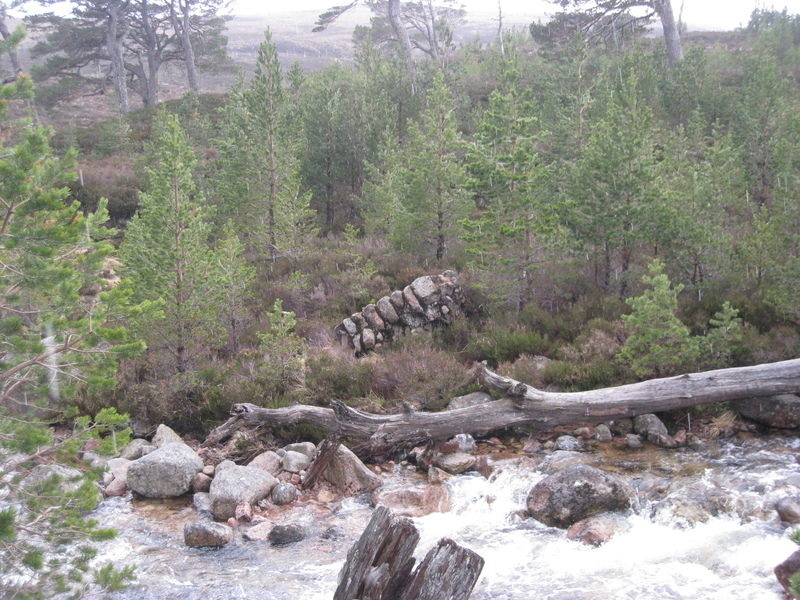 One of the piers of the original Cairngorm Club bridge, built in 1948 and swept away in 1956. Luckily the bridge span was relatively undamaged and was able to be recovered. And having learned their lesson, a new site was sought and the bridge moved about half a mile upstream where it could be set high above the water with foundations in solid rock. It has remained there ever since, used when the burn is in spate or by those not agile enough to loup across the stepping stones. But if you’ve ever moaned at the detour involved in getting there from the main path – now you know the reason for it. This entry was posted in History, Topography and tagged 1829 flood, Cairngorms, luibeg, luibeg bridge, luibeg ford. Bookmark the permalink. Interesting Neil. I note the word bothy in the top right corner and a track in the right lower cutting across the hill side that I am sure is no there now? As storm like that one that raised the river 15ft is one I would not want to see. That would wash out Bob Scotts I think? Hi Martin, the bothy is the Dubh Gleann Bothy, which was another deer watcher’s hut like Corrour, but made from wood. There are a few references to it and even a photo in Ian Murray’s excellent books (See A Cairngorm Library on this site). The track on the lower right of the map is still there, I think, but planted over with trees. I certainly remember using it a few times as a bairn in the late ’60s and early ’70s: my father would take us through Clais Fearnaig and then up to the top of Creag Bhalg by that track. As for the flood… it was the Dee that was up by 15ft in places, but the Lui must have been pretty fiercesome too and would certainly have floodes Scottie’s where it is now. I’ve seen flooding debris coming down the slight depression on the ‘inland’ side of Scottie’s even in the last few years. Oh, forgot to mention: the Dubh Gleann Bothy is long gone, so don’t anyone factor it into any route plans! What a great read. Thanks for that. I’ve often wondered why Bob Scotts’ has a stone base. Now I understand. A great and informative read Neil. I also wondered about the bothy marked on the map. Cheers. Old maps can be fascinating. You think the hills never change, but it’s surprising how much does change over the years.